After the announcement of the change in patter of Civil services exam of 2011 many students have gone into a tizzy that now their hard work has gone waste. Especially the students reappearing for the exam are a disappointed lot with a lot of tension. Civil services prelims have been replace by the newly introduced Civil Services Aptitude Test (CSAT) which includes two objective exams out of which one is a General Aptitude paper and the other of General Studies paper where the GAP exam has replace the option exam. This change has been brought about on the recommendation of the Alagh committee according to whom, "The present testing of the optional subject is based on College/University curriculum. Re-examining the candidates in their own subjects appears to have doubtful utility." According to them the universities which have given the degrees to such students have already done a detailed analysis and examination of such students and evaluating them again in the same field makes no sense. So they should instead be evaluated in subjects which have importance in the job they are applying for which is for Civil servants. The statistics show the difficulty level of the Civil services exams. Till previous year about 2,69,036 applied for the exams, 12,491 qualified the prelims, 2,589 made it to the mains out of which 920 were recommended and a mere figure in tens was the number of selected guys for the coveted IAS seats. This means that a meager 0.3% students made it through and the rest had either lower grade jobs or were simply rejected. As is clear from the stats above out of the lakhs that apply yearly most of the applicants have to try more than once to make it through the exams. This makes it one of the most difficult exams of the time and any change in the format of the examination has therefore had a huge effect on students preparing for the exam from more than a year. Also as this time students do not know what to expect with this change in pattern it had lead to a huge tension and fear among the appearing students. Many of the students feared the exams because they think that "aptitude" means coming face to face with their forgotten fear `mathematics`. I must stress that aptitude does not depend upon the mathematical skills of a person and is instead involves skills for problem solving. Confidence is very important for appearing in Civil services examination so here we start discussing the tips which will help you to appear fully prepared for the exams. 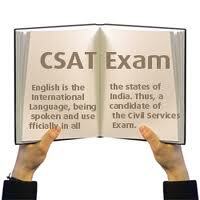 As we know that CSAT now has two papers with equal weightage so our strategy should be to prepare for these tow exams. This part of the paper has been a struggle even for most of the good students. Not many students prepare for it as a general knowledge paper and the reasoning part of the paper can be considered to be confusing for most of the students. Although UPSC has now officially added Aptitude tests in the exams but General Studies was already a part of the process for 4-5 years now. The questions coming in exam by UPSC requires strong reasoning skills along with good factual information. So indirectly all the students were already preparing for the General Studies Aptitude test (GSAT). Just near the exam time students were required to get ready to apply the knowledge in a little different format. (ii) Dynamic part which has no written syllabus as it contains current affairs and general knowledge. Static part is traditionally easy to score because students have a limited syllabus and they can prepare from this part thus scoring high and depending less on the uncertain parts of General Knowledge and Current affairs. Prepare this part thoroughly from books and notes and conceptual questions should be revised again and again to leave no chance for silly mistakes. For strengthening your preparations solve as many question papers as you can even near the examination date. This will bolster you knowledge as well as your knowledge. For broader areas students should go for keyword approach. Understand the theoretical and practical issues with focus on fine details. Focus on the main keywords of the issue which will give you good strikerate and help you complete in time. Finally, solving as many mock tests as possible will only increase your efficiency. English language skills, Mathematical skills, Reasoning skills, Analytical ability and Interpersonal skills. This part sadly has no static part but the method of reasoning and aptitude testing continues in this part. As the above mentioned parts require individual preparation students can select the area in which they are good at and prepare for them only. Near the exam time students should consolidate on the area on which they are best upon by working on practice papers. Going for a thorough practice in this area is very important as once you are able to master a particular logic then you will be able to solve similar questions easily. Though in paper 1 solving more quantity of questions was a major aim but in paper 2 unless you solve the quality questions, which are already few in number, you cannot clear this paper off. Therefore here you need to do smart work selecting the right questions and solving them within the time limit. Students should note that the quantitative section takes up a major chunk of time of any student but even then it cannot be skipped as it has a fair share of marks in the paper. Therefore smart techniques should be adopted for time management as this section has the potential to limit your capability to answer more number of questions. Students from non-English background should not panic about this section as the syllabus clearly says that candidates are required to have the knowledge of only10th class English. So there is no need to go into a panic mode and start digging into deeper aspects and instead focus on the specific syllabus topics. Wrapping up students should focus of specific studies with focus to strengthen the stronger parts while keeping the time management factor in your priority list. This paper it so difficult majorly because of the time management factor so practice of your skills will make a huge difference in pass or fail. CSAT paper is a wholesome exam testing the application quality of the student of the knowledge. When the exam is near, pull out all stops for preparation and concentrate on the key aspects of your preparation.